DeMar DeRozan and LaMarcus Aldridge led the way to a gritty home win. The Spurs and the Timberwolves faced a similar predicament this offseason when their respective best players asked to be traded. They handled it in different ways. San Antonio moved on and tried to build a new team with a new identity. Minnesota held on, choosing to preserve talent and continuity over chemistry. Time will tell which approach will prove successful in the long run, but the Spurs are probably feeling good about their decision right now. They looked like the hungrier team on opening night and took advantage of a Wolves’ squad that often looked discombobulated to get a 112-108 win. While the Spurs eventually looked like the most cohesive unit, It took a while for Gregg Popovich to find lineups that worked. He went through 16 different permutations to the Wolves’ nine in the first half, trying to use quick substitutions to make up for a lack of depth. The strategy worked to a degree. The Spurs managed to get a 10-point lead at one point, but squandered it when one of Pop’s experimental units struggled. They remained on top at the break thanks to a balanced effort by DeMar DeRozan, Rudy Gay and LaMarcus Aldridge, but lacked the consistency to pull ahead by a substantial margin despite a lackadaisical performance by the Wolves’ stars, which struggled in their own specific ways. Minnesota looked rightfully embolden to start the second half. Despite Karl-Anthony Towns’ foul trouble, Jimmy Butler’s lack of rhythm and Andrew Wiggins’ defensive issues, they were just four points behind. At the beginning of the third quarter, they looked more energized and focused. Jeff Teague spearheaded the charge by attacking the feisty but outmatched Bryn Forbes relentlessly. Even a clearly out of shape Butler shook off his rust and looked like himself for a few minutes. Unfortunately for them it wasn’t enough to run away with the game, as Wiggins cooled off after a hot start and an unrecognizable Towns kept committing dumb fouls that prevented him for making any kind of positive impact. The Spurs survived the onslaught thanks to a few timely buckets, but actually headed into the final period down two. Close games will likely be a staple of this season for San Antonio, as they lack the explosive scoring and airtight defense to go on long runs. 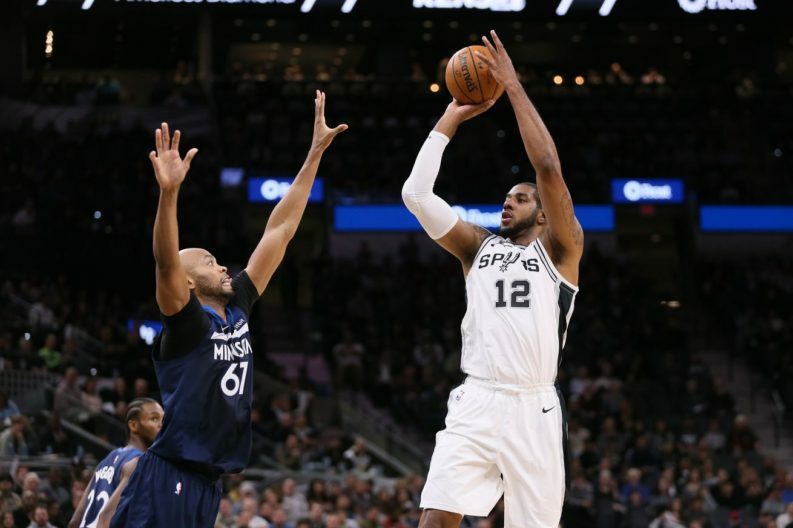 The team’s performance Wednesday night gave fans plenty of reasons for optimism when it comes to the Spurs’ chances of winning in clutch situations. Pop figured out what worked and decided to stick with Davis Bertans for most of the quarter and into the final stretch. Aldridge and DeRozan, meanwhile, showed why they were once top dogs on other teams. LA did amazing work on the glass all game long, but especially in the final quarter. His four offensive boards gave the Spurs extra possessions. While he handled the dirty work, DeMar made big buckets when the team needed them most late in the game to secure the win. It’s hard to imagine a better start of the season for San Antonio. Sure, the dysfunctional Wolves might have helped them pull it off by closing the game poorly, but the Spurs got a gritty win, while shorthanded, against a direct rival for a playoff spot. There’s still a lot of work to do, a lot of areas in which to improve if the goal is making the postseason, but on opening night this group of players looked ready for that challenge. That was all we could ask of them, considering the circumstances, and they delivered. LaMarcus Aldridge showed that he can do a decent Tim Duncan impersonation by putting together an inexplicably quiet 21-19-2-1-3 night. LA got his touches but didn’t pull the offense to himself and was still incredibly productive. That’s bodes well for the future. DeRozan looked like the first offensive option he was brought to be. Despite clearly still adjusting to his teammates, DeMar created buckets for himself an others. He should have had more than four assists, but some of his teammates missed good looks. An auspicious debut for him. Rudy Gay was an efficient third option. He scored within the offense and rebounded well. I’m still doubtful about his ability to defend wings — he struggled at times against Wiggins and Butler — but overall he was a net positive. Pop made some weird decisions. He started Poeltl but only played him for one short stint each half even though Jak killed the Wolves in the offensive glass. He gave Cunningham minutes that should have gone to Bertans and even played the two together next to Pau Gasol, to disastrous results. Pop’s clearly still trying to find rotations the likes. We’ll have to be patient. Forbes did well. Teague torched him a few times, but that was to be expected. On offense he played to his strengths, taking shots when he was open and deferring to DeRozan most of the time. Considering he’s definitely playing out of position, the fact that he didn’t kill the Spurs is enough for me to commend his performance. The shooters hit their shots. Patty Mills, Marco Belinelli and Davis Bertans combined for seven threes on 14 attempts. Bertans in particularly was deadly, going 3-for-4. He also came alive in the second half, when the other two were fading. Great first game for Davis, who also provided good rim protection despite not blocking a shot. Pau Gasol didn’t start the game but logged 22 minutes to Poeltl’s eight. I expect him to continue to get ample playing time despite some struggles containing the pick and roll because he’s arguably the team’s best passer. He finished the night with a game-high six assists. What a disaster of a night for Karl Towns. Some of the fouls called against him were questionable, but it became clear early that the refs were calling the game tight. Fortunately for the Spurs, Towns didn’t adjust and likely cost his team the win by not being there to help on the glass. The Spurs will get a couple of days off before facing the Blazers in Portland. San Antonio will need to find a way to contain Damian Lillard and CJ McCollum or things could get ugly. For the opponent’s perspective, visit Canis Hoopus.